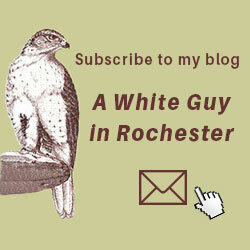 Why a Blog on Race in Rochester – by a White Guy? This blog is public. But it’s also personal. A number of events occurred locally and nationally in the past 5 years that have highlighted major gaps in both my education and my experience. I’ve also become more concerned that the country and city I’m gradually turning over to my children and grandchildren are fraught with racial tension. And, I’ve become more conscious of the interconnections among all of us, including the recognition that our metropolitan area is in serious jeopardy if its core city is choking. I’m also steeped in organizational systems theory, and as I’ve taught many executive clients over the years, if I’m part of the system, then I’m part of what keeps it functioning as it does. I want to understand my own participation in the intractable issues related to race here. And I want to understand what needs to change in my own behavior to have a more positive influence. All to say that this blog is my way of continuing my own learning, my own engagement, my own actions to counteract racism. I’ll be researching, investigating, interviewing and thinking about what is happening and what needs to happen, and then engaging in action. I am committed to being as objective and thorough in my research as I can be, for my sake and yours. I invite you to engage with me: comment with your own experience, affirm or challenge what I’m putting out here, ask questions that puzzle or concern you. Stretch your mind, vet your assumptions. Dare to dig into learned attitudes, uncover blind spots. Find your place in the current reality, then find your place in what’s needed – in your own workplace, among your friends and family, in your town and in your city. “Why can’t they just get over it! This is a public blog. All are welcome. At the same time, I’ll reserve the right to erase personal attacks and bar participation for repetitions. I’m looking to promote/provoke honesty, reality, and challenge. Choices. Choices and decisions, personal ones, are made every day by everyone. Matters not where on the globe you are from or where you were born or where you live now. Each of us is accountable to each other person for those choices and decisions. A mass movement or mindset shift has to start with me. One person. I am responsible for how I think about others and how I treat them. One of my very good friends in college was blind. I led him around campus very often with his hand gently holding my arm. I learned a lot from him and how he sees the world and people. Let each of us choose to me a personal mass movement. To interact with people who are different from you-you need to be able to be open, honest. listen and share your thoughts and feelings regarding your differences to be able to have a relationship. Not many people can do that. I have learned I have to be courageous, assertive and strike up a conversation with someone that is different than me. And be able to accept their rejection and not be judgmental toward that individual. In today’s world being mindful is not always easy.